I am often asked why I don't review for the major children's lit review journals (Horn Book, School Library Journal, etc.). Back in the 1996, I was a book reviewer for Horn Book Guide. I occasionally review a book for them now, but that is rare. I don't recall exactly when I quit, but there were several reasons. I was a grad student then, and doing a thorough review takes a long time.... I needed that time for my studies. There was another reason, though, that I stopped reviewing for them on a regular basis. That reason is the subject of an article I wrote that was published in Studies in American Indian Literatures. The article, "Contesting Ideology in Children's Book Reviewing," is online here. In the article, I discuss the rejection of a review that I submitted. I gave the book a negative review because it shows a boy playing Indian. My review was rejected. The editor, Roger Sutton, said "We review books not on the basis of what they say, but on how well we judge them to say it." He said he understood my objection, but that Horn Book was not the place for that critique. I thought he was wrong, and I was pretty steamed. I sought to explore my idea that Horn Book was not serving librarians with its adherence to literary criteria. I learned a great deal through that exploration, as articulated in the article. Since then, I've met Roger and many others. As Sherman Alexie said, the people in children's book world are really nice. Within this community, there are points we will never agree on. But we keep talking. In May of 2006, I started this blog as a means to keep talking in an unfiltered, unedited, unrejectable way. Here, I share my perspective, research, and expertise on representations of American Indians in children's books, pop culture, etc. I sought to make it a resource, too, linking to items written by people that I've learned from. In some ways, it is a cyberspace classroom. This cyberspace classroom allows me to provide reviews and a perspective that I can't give you through the mainstream journals. In some ways, it is a journal. Last week I asked people to write to me, telling me how they use the things I put here. I learned it is used in college courses, and by librarians, as a selection aide. Authors wrote to me, too, as did editors. If you're among those who wrote, please know that I am deeply grateful. Your words confirm my belief that this is an important undertaking. AILA's "American Indian Youth Literature Awards"
"I is for Inclusion: The Portrayal of Native Americans in Books for Young People"
A new book from Tim Tingle... 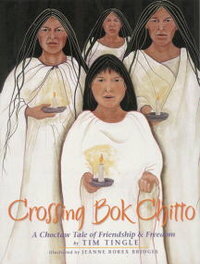 But first, a few words about his Crossing Bok Chitto. On November 1st, 2006, I published here Beverly Slapin's review of Crossing Bok Chitto. There was a brief---but fascinating and informative---series of comments to that post. I encourage you to read them. "Most everybody knows about the race between Turtle and Rabbit. But the Choctaw people tell the story differently. They say that the reason Rabbit couldn't outrun Turtle was that he wasn't racing a turtle at all. He only thought he was. It all took place on the day when Turtle grew feathers." Kids will love When Turtle Grew Feathers! I love it. It joins Joseph Bruchac and Gayle Ross's The Story of the Milky Way: A Cherokee Tale at the top of my list of traditional Native stories in picture book format. Why? There's no ambiguity in its origin or in its title or in its marketing... It's subtitle isn't "A Native American folktale." It is specific. This is a story from the Choctaw people. But there's even more specificity in Tingle's subtitle. He uses the word "Nation" thereby conveying a fundamental piece of information about American Indians. When we use that word, we do because of legal relationships American Indians have with the United States government. We have nation-to-nation, negotiated, diplomatic relationships. That's more information than a teacher may want to impart to a classroom of kindergarten children, but it IS important information for the teacher interested in providing her students with stories about American Indians that come from Native people for whom the story is a living entity. For your reference, click here to visit the Choctaw Nation's website. It is available in a "Classroom Backpack" that includes 7 paperback copies of the book, and a CD of Tim reading the story. DO order a copy of the book, and consider getting the backpack, too. And, take a look at Tim's website. He does a LOT of school visits. Invite him to your school!